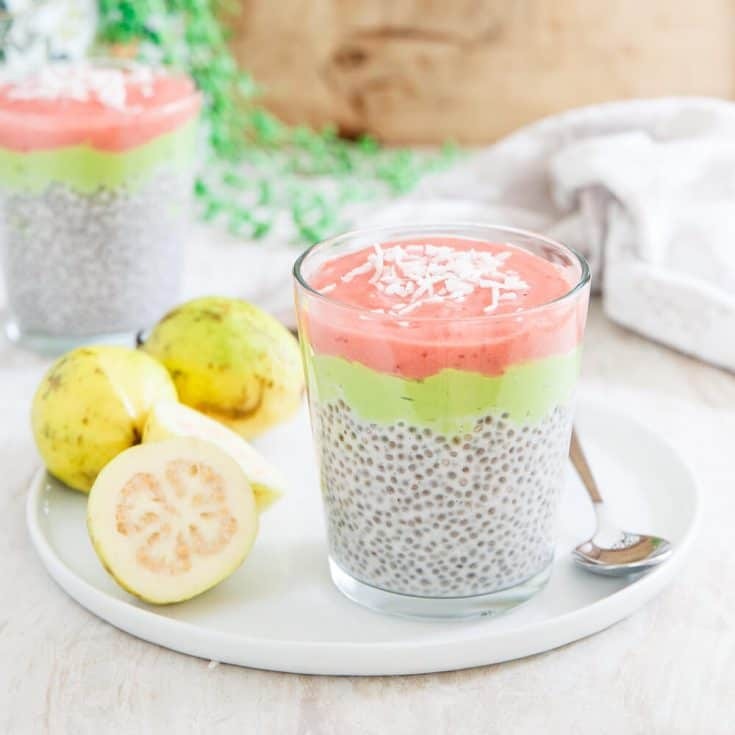 This guava chia pudding has a vanilla chia base, a creamy avocado banana middle layer and a sweet and tangy strawberry guava jam topping. I literally can’t get enough summer fruit this year. I want it all. I’ve traded rice, pasta, potatoes and bread for fruit when it comes to my carbs. Even my post workout meal is now accompanied by such a big bowl of fruit, I can literally watch my stomach bloat like there’s suddenly a basketball in there after eating it all. I’ve been buying the usual summer suspects, peaches, strawberries, blueberries, raspberries, blackberries and all other stone fruits, even melons (who am I, I don’t even like melon?!) but when I saw guava in the store, despite it being from Mexico, it had to come home with me. There wasn’t even a second thought to be had, the fruit cravings took over like a pregnant lady with a midnight ice cream demand and in the cart it went. Outside of my all time favorite kombucha flavor, I honestly don’t think I’ve ever bought guava at home so when I got home from the store and within minutes my kitchen was filled with this unexpected guava fragrance, it took me by surprise. You know smell memories? That’s exactly what happened. That exact smell took me right back to our vacation in Playa del Carmen, Mexico 5 years ago and the breakfast buffet with all the local fruits and jams. At the time, I didn’t know what that smell was but now I know it was the guava making its presence known. Besides its wonderful tropical taste and fragrance, guava also has a few pretty impressive benefits going for it, so many in fact, it’s considered a super-fruit. Incredibly rich in vitamin C, vitamin A, lycopene and antioxidants, it’s also a good source of manganese, folate and fiber. The vitamin A in the fruit has been linked to good eyesight. If you’re not a fan of carrots, try guava for its innate retinol properties. With it’s high fiber content, guava has long been used as a natural remedy for constipation. High folate levels help promote fertility. The generous manganese levels allow the body to absorb other key nutrients. Guava slows down the absorption of sugar in the blood, making it a great fruit for diabetics. The antioxidants in the fruit help absorb free radicals in the body, helping to fight wrinkles, prevent damage from UV rays and signs of aging. Most of the time, guava is associated with a pink flesh-like color but there are actually a few different types of guava. The one seen here is what’s called “lemon guava”, most likely due to its color being more yellow than pink. Regardless, the taste is still the same guava we all know and love. Because I wanted to make things pretty though, I decided to blend the yellow guava with some strawberries for the beautiful pink color you see in this guava chia pudding. Although, it wasn’t all about looks, the delicate sweetness of the summer strawberries helps balance out the natural tang from the guava a bit too. 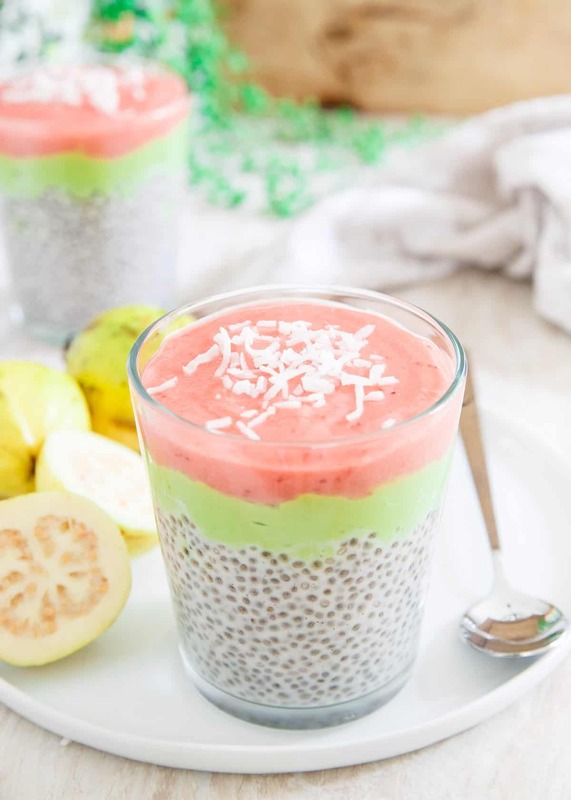 Honestly, in the summer, I could easily forego chocolate cakes, brownies, cookies and the like if a glass with this layered strawberry guava chia pudding was an option any day. 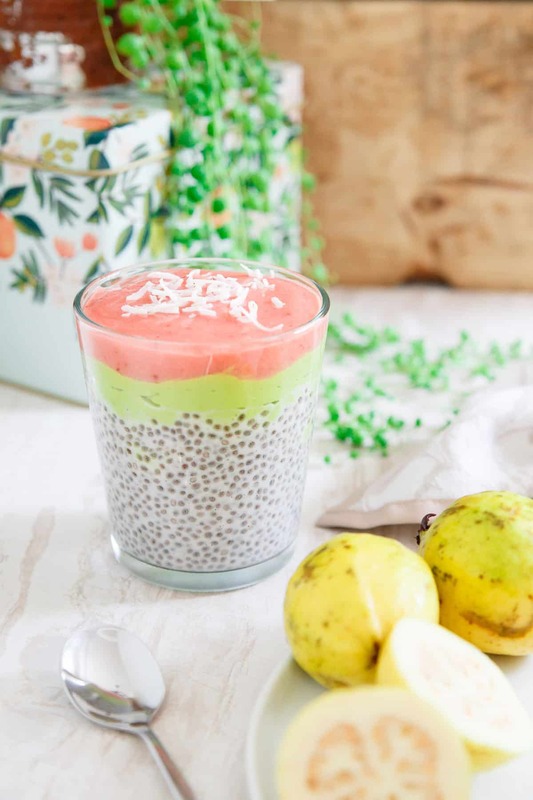 From the vanilla chia pudding base to the creamy sweet avocado middle layer to the fresh, bright, sweet and slightly tangy strawberry guava jam topping, this healthy dessert has it all. It’s gluten free, dairy free, naturally sweetened, filled with healthy fats and a celebration of the best the season has to offer. Whisk all ingredients together in a small bowl. Cover and refrigerate overnight to thicken. Combine all ingredients in a food processor, process until smooth. Transfer to a small bowl and refrigerate until ready to assemble. Add the guava and water to a sauce pot. Cover and bring to a boil. Stir, reduce heat to low and simmer for about 20 minutes, stirring occasionally. Remove cover, continue simmering for another 10-15 minutes until guava is softened. Pour the guava through a fine mesh strainer over a large bowl and using the back of wooden spoon, push the mixture through the strainer to capture the pulp but not the seeds in the bowl. This will take some elbow grease and time, about 15 minutes. Add the strawberries to the sauce pot and cook over medium-low heat, just until softened. Place both the guava puree and strawberries in a food processor and process until smooth. You'll have about 2 cups of leftover strawberry guava jam. Store it in an airtight jar or container in the refrigerator for up to two weeks. Use it in and on everything! This is seriously so pretty! I love those layers! So gorgeous! I’ve never tried fresh guava but this needs to happen soon! 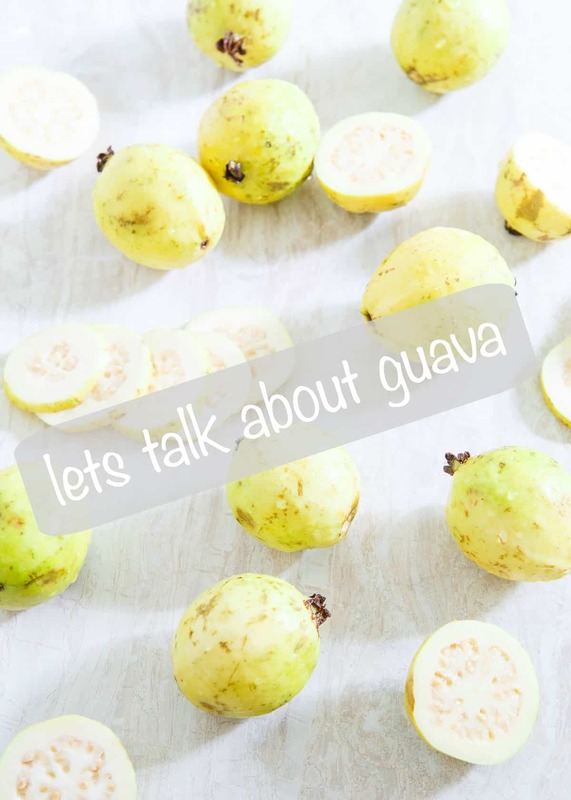 I love the flavour of guava but I’ve never bought it at the grocery store to use at home! This looks like such a gorgeous and tasty way to use it! 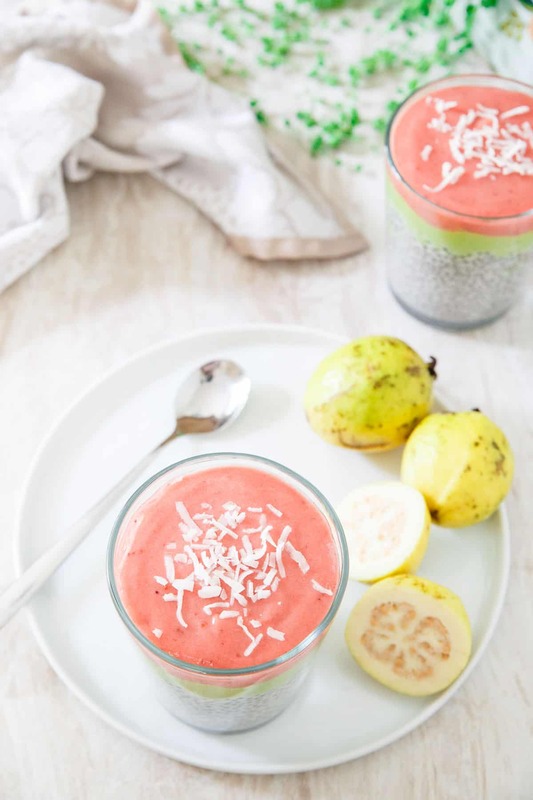 I LOVE guava and absolutely love the color it’s adding to this chia pudding. I can’t get enough of summer fruit either! I may have polished off a 2 lb bag of cherries in just 2 days! The colors are stunning and I love the layered presentation. This looks so delicious, I’ve book marked it to try this out as well. Thank you so much for sharing! After I saw your guava picture on Instagram the other day I knew I had to stop by and check out what you made. 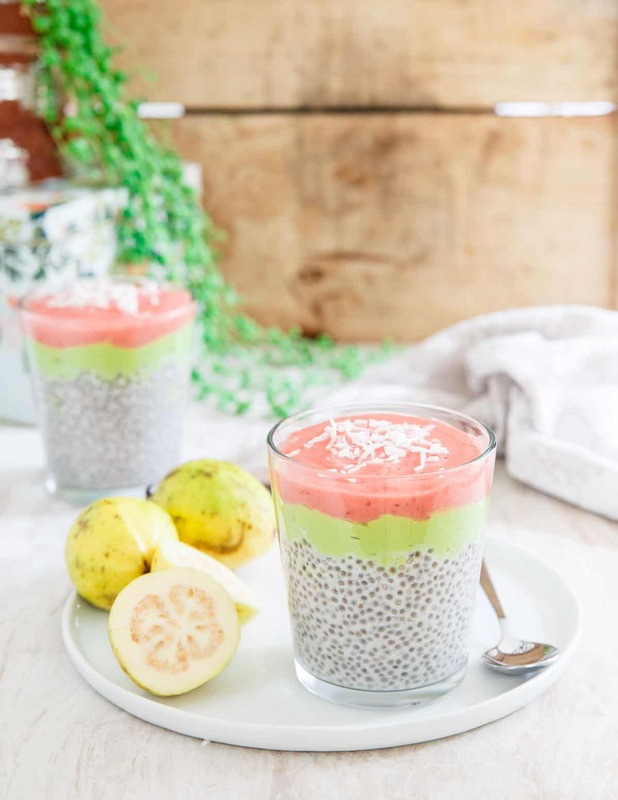 I’m so glad I did because this layered chia pudding is beautiful! I’m so addicted to the stuff and I love all the tropical flavors happening in this one! This is SO pretty!! Love all the flavors and how you can see each layer! This is definitely a must try! Absolutely beautiful colors and photography! Thanks for the inspiration – I can’t wait to try this one out! Oh my gosh, these are just so gorgeous! I’m right there with you on the fruit train, there’s just so much good stuff out there right now! I just had a ginormous bowl of fruit salad for breakfast and it was glorious. I fell in love with guava in Mexico this spring – it’s the best!! These are gorgeous!! What a beautiful colorful pudding! Guavas are the best! They smells so amazing and I bet they taste amazing in this pudding! I have also been craving fruit like CRAY. I’ve been eating it for breakfast and lunch every day–sometimes even dessert at night! But summer is the best season for fruit! Berries, peaches, grapes, figs, so much more! This pudding looks delicious! When do grocery stores sell guava ? I don’t think that I’ve ever eaten guava. I’ll give it a try and see if my husband will eat it. He doesn’t like pudding! ALMOST too pretty to eat ~ guavas slay me, I can’t resist!